One never knows to what extreme we will go to protect our family, blood or otherwise, until we are put to the test. The Flash/Barry (Grant Gustin) and his team find themselves in a quandary, when Lisa Snart, AKA the Golden Glider (Peyton List), seeks them out to help find her brother Lenny/Captain Freeze (Wentworth Miller), who has been kidnapped. Needless to say, it’s hard for them to not believe this is nothing more than a trap. Why would a known felon and enemy of The Flash want anything more? After a little arm twisting, in the form of quilt, Lisa reminds Flash that he owes Lenny for saving his life. 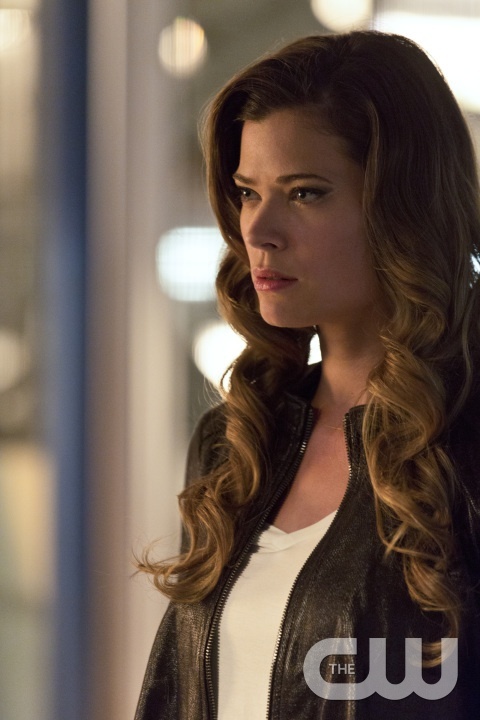 The Flash — “Family of Rogues” — Image FLA203a_0321b.jpg — Pictured: Peyton List as Lisa Snart — Photo: Jeff Weddell/The CW — ÃÂ© 2015 The CW Network, LLC. All rights reserved. Flash finds Lenny with Cisco’s help, but, he’s far from kidnapped, he’s working with his Father Lewis (Michael Ironside), who makes Lenny and Lisa look like Saints. To prove he’s loyal to his Father, Lenny blasts Flash with his Freeze gun. Thankfully, Cisco had the hindsight to install thermal threading within Flash’s suit, which once heated, thaws Flash out, but not before Lenny and Lewis can get away. Obviously, Flash and his Team feel duped. Lisa explains there has to be something more at play. Lenny hates their Father. He was/is an abusive, evil man. If Lenny is working with him, he has to be in trouble. Barry pays Lenny a visit, questioning why he’s working with his Father. He tells him things are complicated and he shouldn’t waste his time trying to save people who don’t want to be saved. 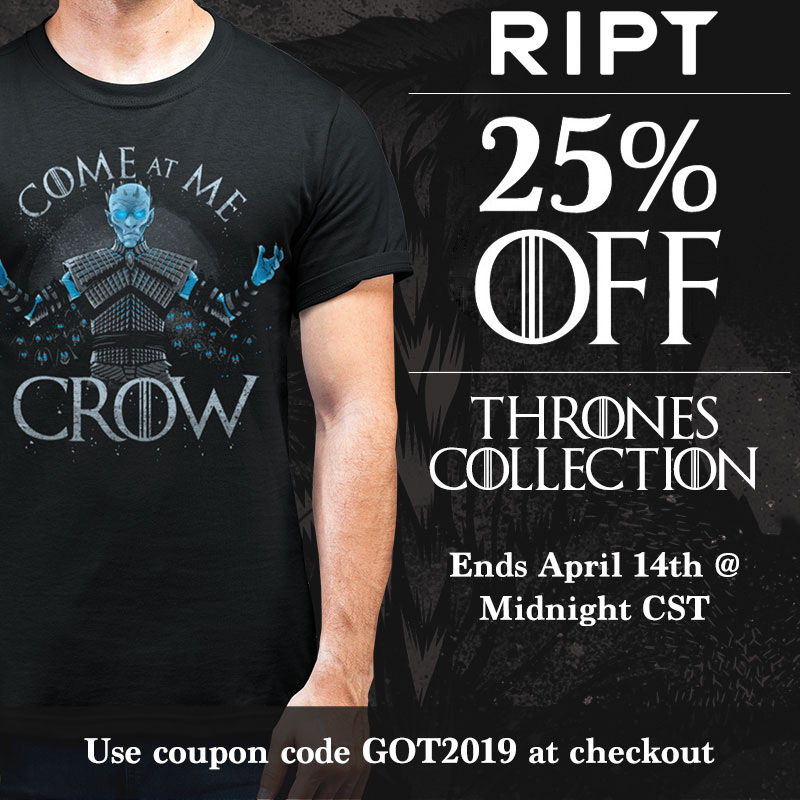 Barry doesn’t buy that. He points out that he may be a criminal, put he lives by a code. His Father doesn’t. People will get hurt and he can’t have that. Joe (Jesse L. Martin) has his own troubles that run just as deep as the horrors in the Snart family. Turns out his wife Francine (Vanessa Williams), Iris’ Mom, is not dead. She was a drug addict and after one too many scares with her passed out at home leaving Iris alone, plus unsuccessful stints in rehab, he made her leave. Since Iris was young and wouldn’t remember, he was able to keep alive the happy memories and block out the bad. That was until Francine walked backed into town wanting to see their daughter. 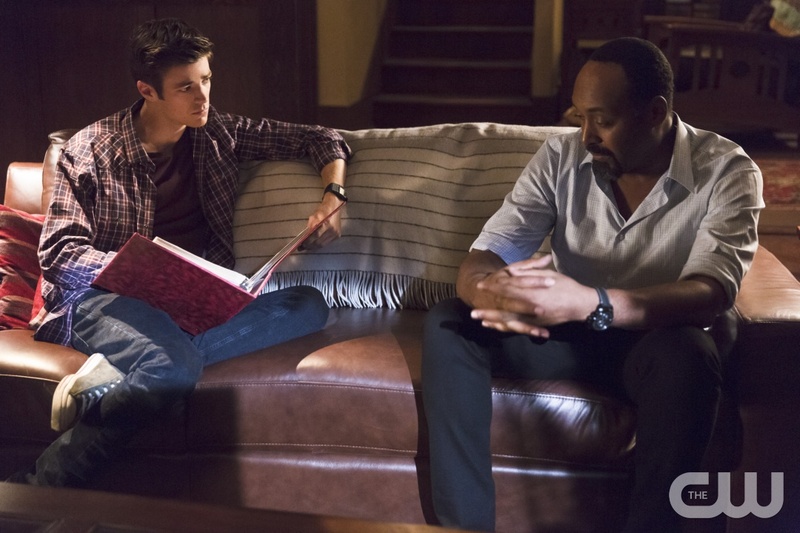 The Flash — “Family of Rogues” — Image FLA203a_0469b.jpg — Pictured (L-R): Grant Gustin as Barry Allen and Jesse L. Martin as Detective Joe West — Photo: Jeff Weddell/The CW — ÃÂ© 2015 The CW Network, LLC. All rights reserved. After a extremely emotional conversation between Joe and Iris (Candice Patton), Iris is willing to except the fact that her Father lied to her in order to protect her. Amid all the family turmoil, Flash and his Team are dealing with the biggest breach/portal/wormhole in the basement of Star Labs. They’d be thrilled if they could use it to track down Zoom, unfortunately everything they try to put through, to include Barry/Flash, is bounced right back out. Jay (Teddy Spears) points out that the portal is like a door and between each door is what could be considered a hallway. These hallways keep shifting, thus causing an instability in the door/portal. If they could stabilize their door, they could stabilize the hallway between worlds, thus allowing people and things to pass through. Creating a speed cannon to another world. With Caitlin (Danielle Panabaker) by his side, Jay sets out to solve this problem. He is anxious to get back to his world. Caitlin, on the other hand would rather see him stick around. She points out that being a Superhero is about being helpful wherever you can be, not just about having superpowers. His work as a scientist is equally as important. Meanwhile, we discover just what Pappa Snart has up his sleeve and why Lenny has become his ally. Turns out Lewis has plans for a big jewelry heist, but needs Lenny’s freeze gun to pull it off. Knowing Lenny’s weak link is his sister, he planted a concentrated bomb in Lisa’s head after he knocked her out during a botched heist with Lenny. She has no clue, which is why she thinks Lenny has been kidnapped. Lenny gets to see first hand how lethal these bombs are when the security expert Lewis has brought in pisses him off when he disses Lenny, so, he blows his head up. By chance Cisco (Carlos Valdes) discovers thermite on Lisa’s skin which leads him to discover the implanted bomb. Now the question is how do they remove it? With no clue as to what Lewis has planned, Barry/Flash decides the best way to find out is to go undercover, posing as a security expert, but not without first letting Lenny know he knows about the bomb in Lisa’s head. 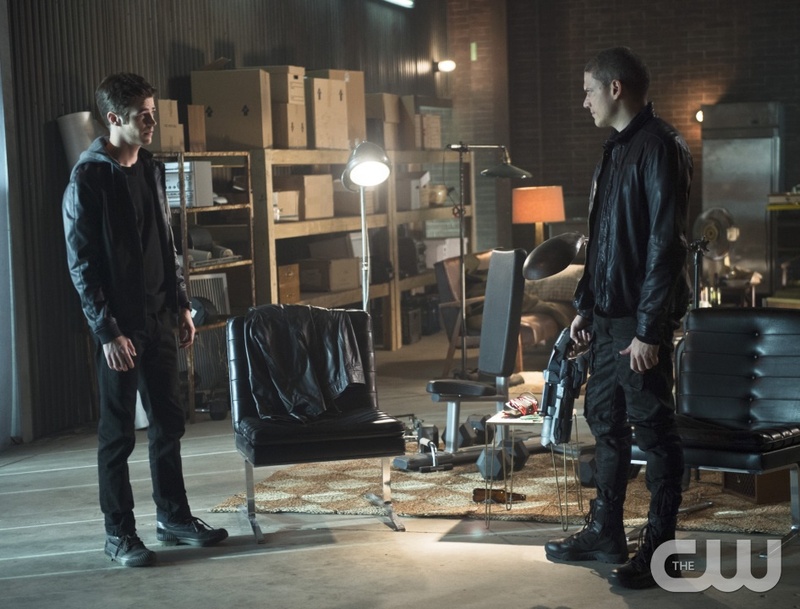 Gustin as Barry Allen and Wentworth Miller as Leonard Snart — Photo: Diyah Pera/The CW — ÃÂ© 2015 The CW Network, LLC. All rights reserved. Barry successfully pulls off the role of code cracker, but Lewis has no plans of giving him his share of the take. Quickly shooting Barry the minute the door is open. As Barry lies on the floor, Father and Son enter the laser protected room. Lenny’s freeze gun takes care of the lasers, breaking them like ice cycles. Before the two can get out with the goods, Flash shows up. His speed was no match for the bullet, catching it with his hand. Once he has word from Cisco that the bomb has been removed from Lisa’s head, he tells Lenny Lisa is safe. Lenny then shoots his Father instead of Flash, telling him he hates him more. 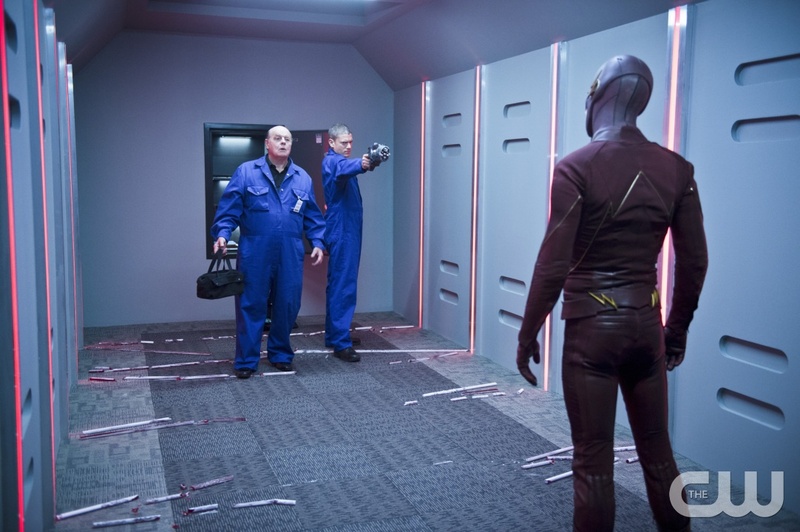 The Flash — “Family of Rogues”– Image FLA203b_0366b.jpg — Pictured (L-R): Michael Ironside as Lewis Snart, Wentworth Miller as Leonard Snart and Grant Gustin as The Flash — Photo: Diyah Pera/The CW — ÃÂ© 2015 The CW Network, LLC. All rights reserved. Back at Star Labs, Jay and Caitlin have skillfully stabilized the door/portal. Caitlin was also able to convince Jay to stay till they can eliminate Zoom, thus securing the safety of everyone’s world. Not before they figure out a way to help Stein (Victor Garber), who’s blood pressure troubles are due to the powers that Firestorm had trying to take over his body. With Ronnie gone, they need a vessel, unfortunately Stein’s is not the right one. In addition, they may have more troubles beyond Zoom. Now that the portal is secure, Wells (Tom Cavanagh) from another world has been able to waltz right into theirs. Who’s side is this Wells on? Could he actually be Zoom?